Radio professionals and even media surveys prove one thing beyond doubt. That radio for all its potential and history in India has not grown to its full glory. Many attribute this to misdirected government policies that do not recognise radio as a perfect medium for entertainment and community development. Yes, radio broadcasts have been unshackled to a great extent and media houses are exploring airwaves. Still, as the number of FM stations grows, programming spans remain stunted. Most FM stations get stuck between government regulations and revenue generation and lose sight of sensitive programming. India means many things to its people. So does radio. To some, it is just the sound of music that keeps them company on their commute back home. To others, it is a memory of hearing the live account of an Indo-Pak hockey match in 1978 on a charpoy under a starlit sky. Many associate radio with the voice of a favourite RJ who added poetic and philosophical overtones to a song and somehow made your day or night. Others smile as they recall favourite jingles. Some people just want to hear instrumental music through the day. Others want a station devoted only to vintage film music. Radio cannot solve the worlda��s problems but it does make life easier. Or used to, because many young music addicts now go to SoundCloud and online resources like YouTube to hear music. People in smaller towns and villages tune into All India Radio because the idea of niche programming is alive only in AIR. 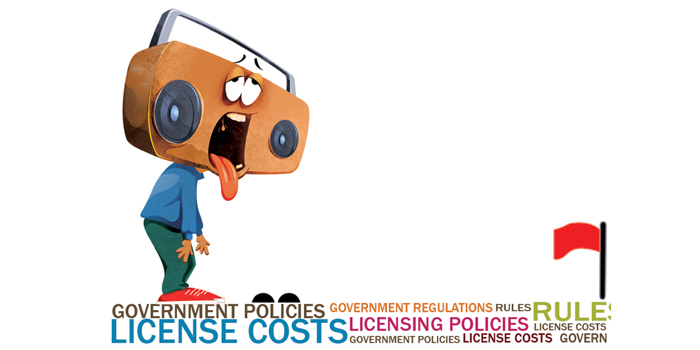 License costs and licensing policies make radio a tough business to crack. Till the revenue generation becomes easier, radio will not blossom as a medium or recognise the power of niche programming, where every one from an Osho-loving autorickshaw driver to a school girl to a housewife in Barnala will have a favourite station to tune into.